Vital Castro lived in La Fortuna when the Arenal Volcano first erupted in 1968. Forty-five years later, he remembers how it changed the town. LA FORTUNA, Costa Rica – “Señor Castro! Señor Castro!” A gate is buzzed open, and there at the front door stands Vital Castro, “the man who knows everything” about La Fortuna. The smell of wet moss emanates from plants perched alongside the zigzag walkway leading to the front door, signaling the rainstorm that is to come. Pictures of grandchildren and black-and-white family photos cover the light green walls of the living room. In the corner of the room stands a statue of Pope John Paul II circled by a red rosary and satin-covered jewelry boxes. Castro, 84, makes himself comfortable on one of the teal-colored couches located in the center of the room, careful not to wrinkle the crocheted covers draped over the cushions. Rain begins to fall upon the tin roof in chorus with the clanking of pots and pans in the kitchen nearby, and for a moment Castro stares into the distance in silence. His soft eyes glisten in the dim lighting as he begins to tell the story of the day he almost lost his life. It was July 31, 1968, just two days following the eruption of the nearby mountain, Cerro Arenal, which had revealed itself as a deadly volcano to the agricultural communities located at its base. “Some men came by in a truck to take me to the mountain that day to burn cattle that had gone blind,” Castro said. His uncle stopped by Castro’s house to ask where he was going. When Castro replied that he was going to the volcano, his uncle warned him against going. “And he said, ‘You can’t go, because in one minute you could be dead.’ I started praying to God to tell me how I could tell them that I couldn’t go, because now I was afraid,” Castro said. They agreed and went on without him. A short time later, while he was preparing the soup, he heard blasts from the mountain. The truck that had taken his friends and family up the mountain had been completely burned by yet another eruption. Eight people were killed by the explosion, two of them Castro’s cousins. As Castro recounts the story, he pauses for a moment to remember. He names each individual, describing one as the largest young man in the community, another as a father, another a husband, another a coworker. It wasn’t until the day of the eruption that the community learned Cerro Arenal was a volcano. The blasts Castro had heard would be repeated in the days, months and years to come. 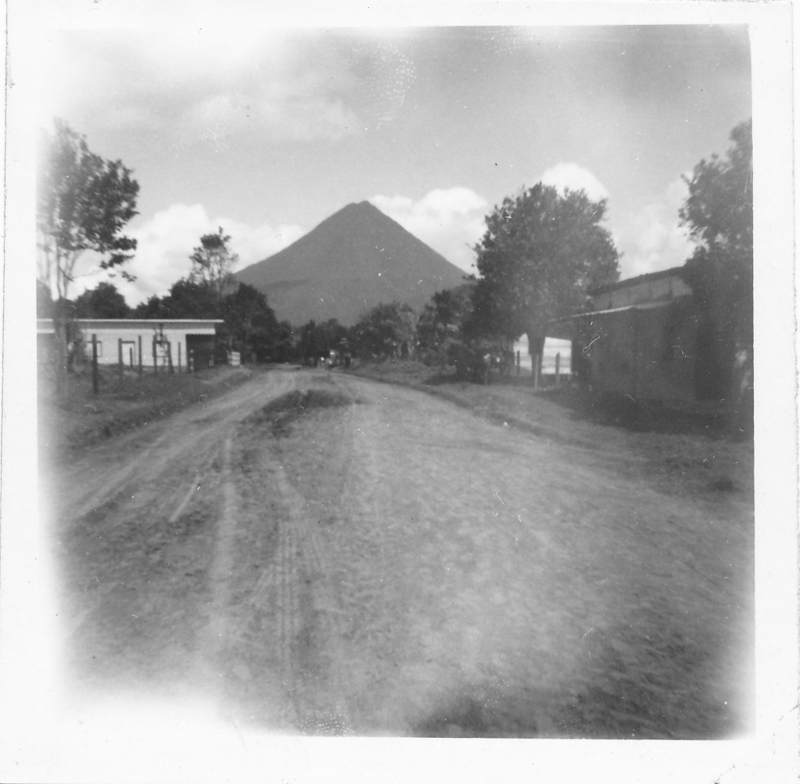 Originally known as “Cerro Arenal,” this was the view of the volcano from the main street in La Fortuna in the year before it first erupted in 1968. Photo provided by Koky. Time ran out on July 29, 1968. The night before there had been a terrible wind, sirens of the horror to come. The wind had kept Castro and his family awake all night, but that morning he decided to attend his construction job at the church as he always did. Boom. At 10 a.m., Vital heard the first eruption. He rushed back home. News of the eruption began to spread at 11 a.m. by word of mouth. Castro, his wife, and 10 children packed into the back of cattle trucks along with other families from La Fortuna and were evacuated to a school in Ciudad Quesada. For three months that school was home to 4,000 people. “The school was the size of a city block and had an auditorium of about 40 by 30 meters. And the classrooms were used to cook and store food. We all slept in the auditorium,” said Castro. For the first week or two Castro and his family lived at the school. He moved his family into a rental house for the next two months. 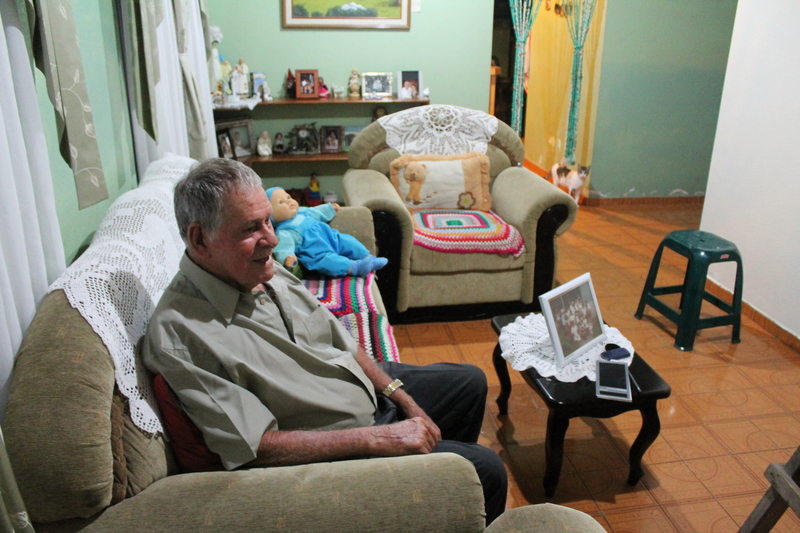 He and his family were excited about the variety of fish and vegetables that would be available for them in Ciudad Quesada. But their expectations of gaining weight did not come to pass because the stress of their situation caused them to lose weight instead. In the days that followed the eruption, Castro returned to La Fortuna on his own. There was work to be done: burying the victims. People began to dig a mass grave to bury 40 of the 80 victims that had been found. The others would be buried in Ciudad Quesada. While Castro went to get some sheets to wrap the bodies in, a cloud containing a mixture of sand and gas created a wave of panic in the cemetery as small pieces of lava fell from the sky. In another part of La Fortuna, then 8-year-old Rafael Rodriguez Arias was experiencing the aftermath of the volcano’s eruption. Rodriguez’s father worked on a farm near the volcano and drove with his boss to see what had happened. Rodriguez’s mother always had coffee and food on hand, and his house was a common place for people to come. On this day, they flocked to the Rodriguez home while she prepared bottles for the babies and other necessities. Neighbors who had the means began to provide lunches for people as well. Castro said that the town survived but its character changed. “At Christmas time everyone would go see everyone else’s portales (decorated entrance hallways), and people gave you coffee and food. It was really beyond compare,” Castro said. As the clouds of ash blew away, clouds of tourists rolled in and the sense of community shifted. At some point in the years that followed the eruption, a myth about the town’s name began to grow. Originally named El Burio, word spread via guidebooks and later online that the town had been renamed La Fortuna because it was one of the only towns near the volcano to remain untouched. But according to Castro, when he moved to the town in 1951, it was already called La Fortuna because it was a place where people came to profit from agriculture and other endeavors. Tabacón and Pueblo Nuevo received the worst of the damage from the 1968 Arenal eruption, with Pueblo Nuevo submerged completely in lava and ash. Satisfied that his visitors have begun to grasp the significance of the day and how the volcano continues to shape the community of La Fortuna, Castro requests that they visit the cemetery. 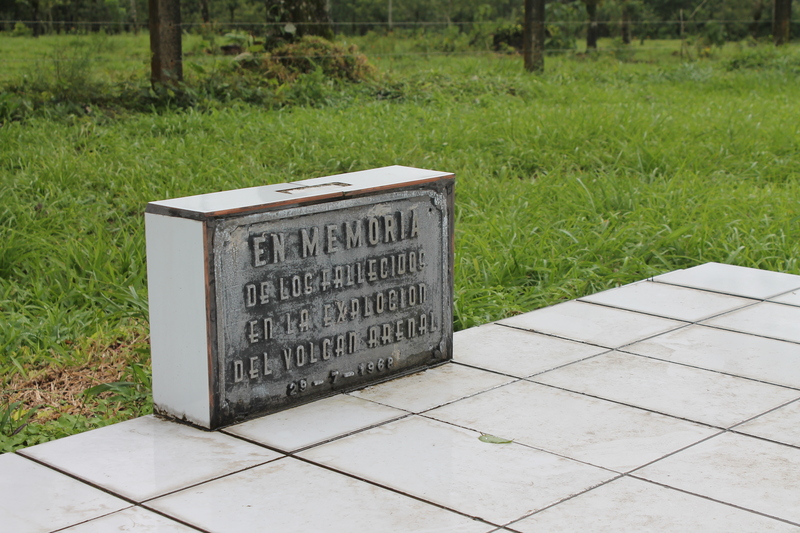 The mass grave where 40 victims of the 1968 Arenal Volcano eruption are buried. Forty more are buried in a cemetery in Ciudad Quesada. 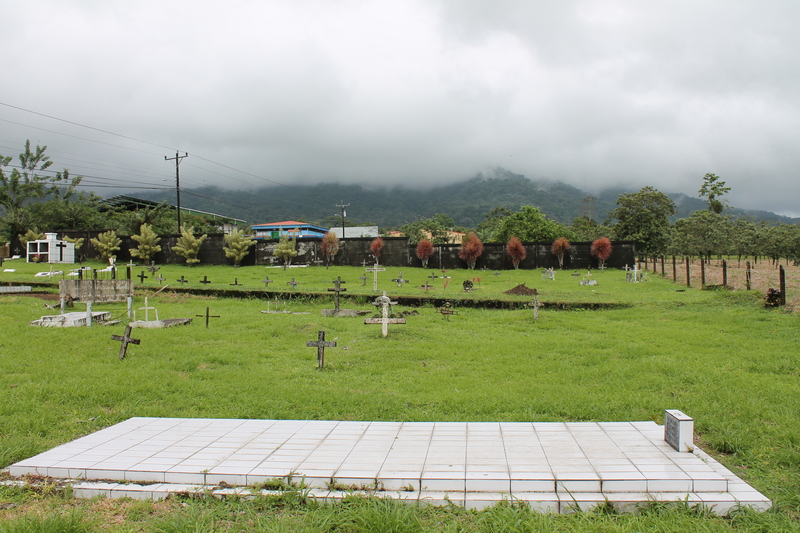 Green grass, crosses, flowers, rosaries and a tombstone decorate the final resting place of the 40 souls buried in La Fortuna’s cemetery. There they will lie, forever in view of the volcano that took their lives.